On numerous occasions in her 30+ years as a registered nurse, Mary observed that humor and laughter seemed to help people bounce back from illness and to heal. She hungered to learn more about how humor affects chronic illnesses. After being invited by a friend, Laskin became a Certified Laughter Leader through World Laughter Tour. She later became a Laughter Yoga Leader and a founding member of a non-prof t group called, Laughter Matters, where they would hold laughter yoga sessions for the community, train other LYL’s, and network with likeminded people. Mary was introduced to AATH through Steve Wilson, psychologist and Co-Founder of World Laughter Tour. She attended her first AATH conference in 2010 in Anaheim, California, where she was hooked on humor. After experiencing the humergy of the AATH conference, she attended a pain nurse’s conference that was too painful to sit through because it was SO SERIOUS! A confirmation that she should incorporate more humor into her daily practice! Laskin, now intrigued with how humor can help alleviate pain, investigated the effects of laughter on patients experiencing pain as a level 2 HA project. She was able to incorporate the project into her role as RN Case Manager in a Chronic Pain Management clinic. The patients who participated in her humor project overall gave very positive feedback about the physical and emotional benefits of laughter helping to ease their pain. The feedback that meant the most to her was the response to the question, “Would you recommend a laughter class to others with chronic pain?” The interesting results showed that, 99% of the participants said they would recommend laughter, 1% said, “I don’t know,” and NO ONE said no! 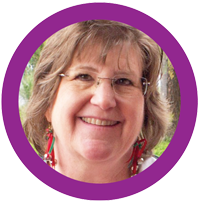 Mary especially finds the research results offered through AATH beneficial to her nursing practice because this is what western medicine is looking for to validate the use of humor in healthcare. She is often heard quoting Dr. Lee Berk’s and Dr. Michael Miller’s research and was very excited to hear both speak at this year’s AATH Humor Conference in Mesa, Arizona.